The Utah Grizzlies want to keep building on their highly successful 2015-16 season. The team’s progress took a positive turn recently when eight players from last year were issued qualifying offers for the 2016-17 ECHL season. By extending the qualifying offers, the Grizzlies will retain the ECHL contract rights to the eight players for the upcoming season. Utah coach-GM Tim Branham chose to offer contracts to forwards Barry Almeida, C.J. Eick, Alex Gallant and Erik Higby and defensemen Marc Cantin, Connor Hardowa, Phil Pietroniro and Shayne Taker. “There are different reasons that go into choosing qualifying offers for each guy, but those eight guys played a big role in our success and I certainly want them to play in Utah again next year, so I gave them a qualifying offer,” explained Branham. Players under contract with the Grizzlies’ NHL affiliate, the Anaheim Ducks, are not eligible to receive qualifying offers. Almeida (pictured) scored 29 goals and added 19 assists for 48 points in 57 games with Utah in 2015-16 and has signed to play in Italy for the upcoming season. Eick played in all 10 playoff games (one goal, one assist) and the final seven regular-season games (two assists) after signing with Utah out of Michigan Tech University in March. Gallant signed with the San Jose Sharks organization during a call-up from Utah last year and Higby posted 15 goals and 18 assists for 33 points in 74 games with the Grizzlies last year. On the blue line, Cantin was voted the Grizzlies’ Best Defenseman in 2015-16 and totaled three goals and five assists for eight points in 10 playoff games. Hardowa leads Utah defensemen with 98 regular-season games played last two seasons with eight goals and 26 assists and has appeared in 19 playoff games over that stretch. 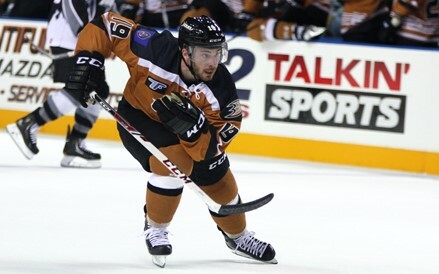 Pietroniro, named the Grizzlies’ Most Improved Player during second half of his rookie season, joins Taker, who served as an assistant captain in 2015-16 and was called up to the Ducks’ American Hockey League affiliate in San Diego twice. In addition, the Grizzlies re-signed forward Jon Puskar. The Grizzlies open next season Friday, Oct. 14 and Saturday, Oct. 15 when they host the Idaho Steelheads for two at the Maverik Center.